August | 2017 | PlugInCaroo… Karo plugin… abhi!… save the environment!!! 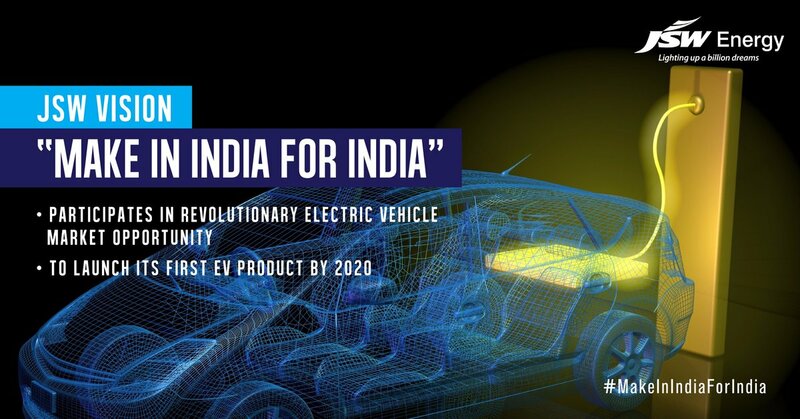 JSW Energy a company with net profit of 2.17 billion rupees for the quarter ended June 2017 is now embarking upon the journey to build electric cars, batteries and charging infrastructure in India as a part of its diversification plans to drive future growth. It plans to invest up to 40 billion rupees ($623 million) over the next few years and expects its first electric car to be rolled out by 2020. In a welcome break it is the first non-automotive company in India to not only build electric car but batteries and charging infrastructure too. This entry was posted in Uncategorized and tagged charging points, charging stations, E2O, electric, Electric car, Electric Vehicle, intercity charging points, interstate charging points, JSW, Mahindra, PlugInCaroo on August 15, 2017 by PlugInCaroo. Making an electric bike is a very good project for those who already have a bike and want to experiment or want increase the distance they travel or make their travel easier. In a world that is slowly moving away from petrol vehicles to electric vehicles it is very important for every student who is even remotely connected to automobiles to undertake this project. This entry was posted in Bike, Electric Bike, Uncategorized and tagged 250 वाट, 250 watt electric बाइक, इलेक्ट्रिक बाइक, इलेक्ट्रिक साइकिल, नौकरी, पैनल, बैटरी, लिथियम-आयन, लिथियम-आयन v/s लीड एसिड बैटरी, लीड एसिड बैटरी, सौर, सौर पैनल, स्वचालन, हब मोटर, Do It Yourself DIY E bike DIY Kit Electric Bicycle DIY Kit, e bicycle kit India, e bike electric bicycle motorized bicycle bike shop electric bike kit electric kit, E-Bike, e-cycle, Ecycle, electric bicycle kits, electric bike kit, Electric cycle, electric cycle kit, Electric cycles का लाभ, How to make a solar bike, How to make an e bike, How to make an ebike, How to make an electric boat, How to make electric bike, How to make electric cycle, lacing on August 9, 2017 by PlugInCaroo.